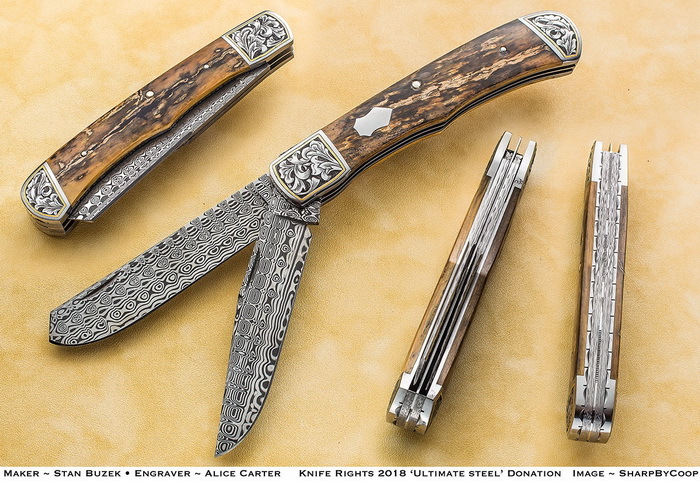 **** Chosen by Winner: Edward F.
Stanley Buzek's elegant Double-Bladed Slipjoint Trapper features 3.125-inch clip point and spay blades of Damasteel stainless Damascus with Damasteel backsprings. The handle is well-figured mammoth ivory bark with 416 stainless steel bolsters and shield. The bolsters are beautifully engraved with 24K Gold borders by Alice Carter. The liners are hand fileworked. Stanley Buzek is a hobbyist knife maker living in Waller, TX. He notes: I have been interested in knives from an early age. My dad gave me my first knife at the age of nine- a small Barlow which I carried for years till I finally sharpened the blade away. My grandmother had a small hand made knife I always admired. It was made by my uncle J.R.Buzek during WW II while stationed aboard an aircraft carrier in the South Pacific. He made the knife from a band saw blade, pieces of Plexiglas from aircraft canopy’s and salvaged aluminum. At my grandmothers passing I received this knife and treasure it today. I plan to hand it down to my grandson along with a few of mine. I mainly make slip joint pocket knives, liner lock and frame lock folders. My steels of choice are CPM154 for stainless steel and O1 for carbon steel. I use most all handle materials including Stag, Dyed Jigged bone and Fancy Stabilized woods. My knives have been featured in Blade Magazine, Knife World, Knives Annual 2013 and Knives Annual 2014. I hope you enjoy my creations as much as I do making them.